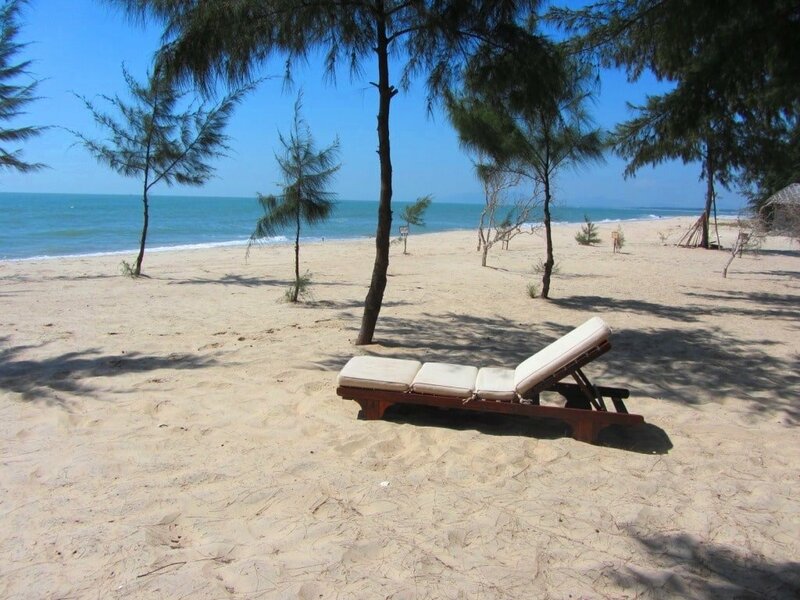 Two long and wide stretches of sand, Ho Tram and Ho Coc are by far the best beaches within easy reach of Saigon. Forget Vung Tau, Long Hai and Can Gio: if you’re a Saigon expat with a mini-break of a couple of days, or a traveller looking for a short trip out of the city, this is where you should be heading. 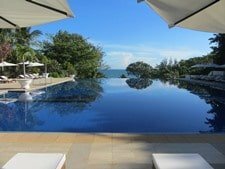 Mui Ne, Phu Quoc and Con Dao all have ‘better’ beaches, but because of travel time (in the case of Mui Ne) and airport hassle (in the case of Phu Quoc and Con Dao), they are better-suited to longer trips of at least 3 days. Thanks to upgraded roads, Ho Tram and Ho Coc beaches are now only 2-3 hours from Saigon. There’s a growing choice of accommodation, good food options, and lots of activities to keep you occupied. I’ve been visiting these beaches regularly for almost 10 years, and they remain my favourite short trip from Saigon. The beaches are just 110km from Saigon. As with most places in Vietnam, try to avoid weekends and (especially) public holidays, when prices are inflated and crowds and litter abound; during the week the beaches are very quiet. Any time of year is good, but the most consistent weather is during the dry season, from November to May. Seawater can become murky during the rainy season due to runoff from the land and rivers. To experience these beaches at their best, either book into a good beachfront accommodation in advance and treat it as an relaxing escape from the city, or travel independently (preferably by motorbike), doing it on the cheap, and taking it as it comes. Below I’ve written a brief description of Ho Tram and Ho Coc beaches. Bear in mind that, although these are both very pretty beaches, the water and sand are not quite the same quality as other popular beach destinations in Vietnam, such as Mui Ne, Nha Trang, and Phu Quoc. But the whole point of Ho Tram and Ho Coc beaches is that they are within easy reach of Saigon, and this is where you come if you don’t have enough time to visit the other, more popular, beaches. 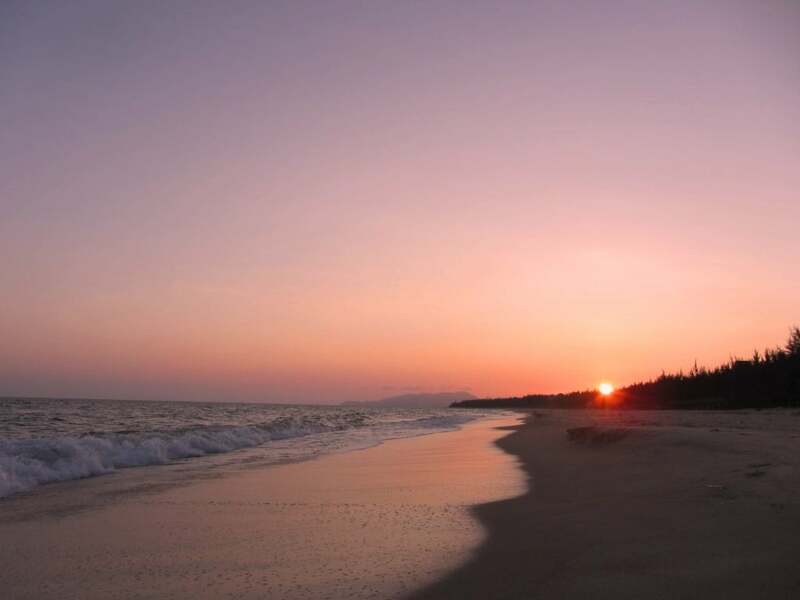 Stretching from a sandbar in the west, all the way to the tiny fishing hamlet of Ho Tram in the east, this beach is over ten kilometres of fine sand backed by casuarina trees. 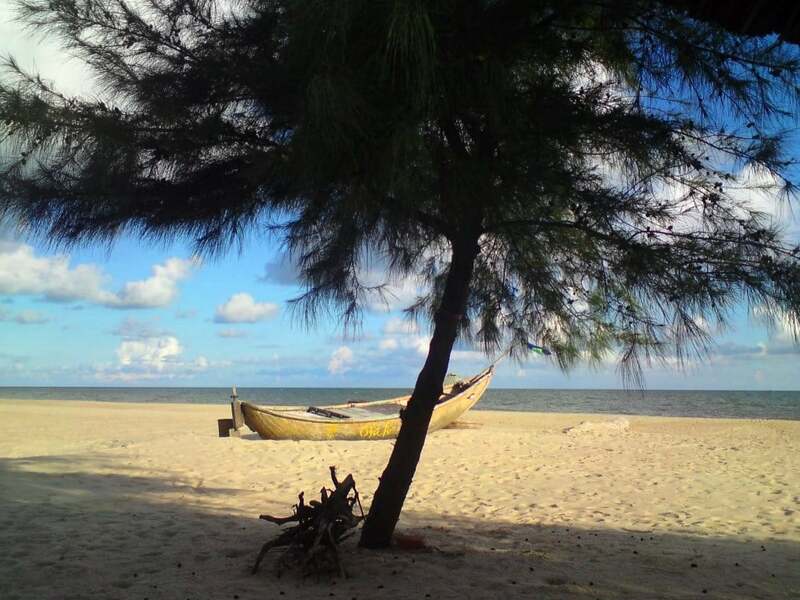 To the west of the beach, the long sandbar, formed by the Ray River, is a terrific location, with the East Sea on one side and the river and mangrove forest on the other. The sandbar has a few accommodations on it (including camping), but it’s still a long way from realizing its potential. Moving east from the sandbar, most of the land between the road and the beach has been portioned off for the development of large resorts and residences, including the ultra-luxurious Hamptons. However, construction work is very slow, and the only resort to have opened on this section of beach is the superb Ho Tram Beach Boutique Resort. Further east, towards Ho Tram fishing hamlet, there are several thatched seafood restaurants which also rent deck chairs on the beach, and some offer camping too. Just before the crossroads at Ho Tram hamlet, Sanctuary luxury villas offers a glimpse of what the future holds for this beach. But, apart from that, Ho Tram hamlet is still a pretty local, sandy and salty place. There’s access to a public beach here, but it’s tainted by fishermen’s debris. However, the little seafood shacks lining the road are excellent, and there are several cheap accommodation options too. 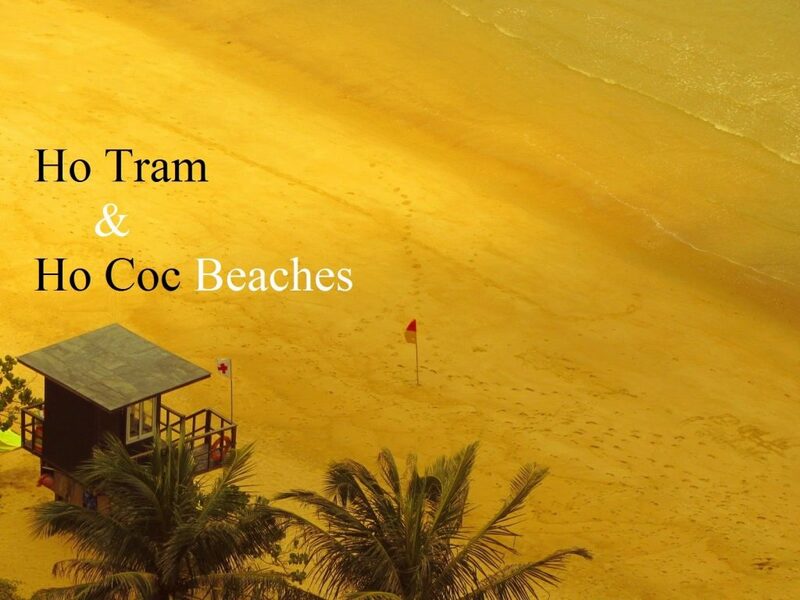 Stretching for 10 kilometres from the bluff just north of Ho Tram hamlet, Ho Coc Beach is an arc of light-coloured sand backed by densely forested hills. When seen on a good day from the top of the bluff, the curving bay, blue sea and green hills are very picturesque. Lording it over the entire bay, The Grand Ho Tram is a recently opened integrated resort, which has really put this area on the map. Although called The Grand Ho Tram, I always think of it as geographically belonging more to Ho Coc. Moving northeast up the bay, down from the hill, the forest gives way to the sea. Several informal beach shacks and seafood restaurants offer access to this great portion of beachfront. At the Ho Coc crossroads, Ven Ven Hotel has fantastic food and rooms in a lovely, shady setting, albeit on the ‘wrong’ side of the beach road. Opposite, there are two large, sprawling mid and high-end resorts which charge a small fee for beach access, and where camping is also available. The beach and scenery here are beautiful, but it should be noted that the sea quality fluctuates during the year, and conditions are often too rough or unpredictable to swim. The ocean road continues to hug the coast for several kilometres beyond the Ho Coc resorts, passing a deserted, boulder-strewn coastline that’s great for exploring on two wheels (although trash has really started to blight this area). The beaches are the main attraction. If you’re staying at one of the beachfront accommodations then you’ll have easy access to a good stretch of sand. But if you’re a budget traveller or a day-tripper you have a couple of options. 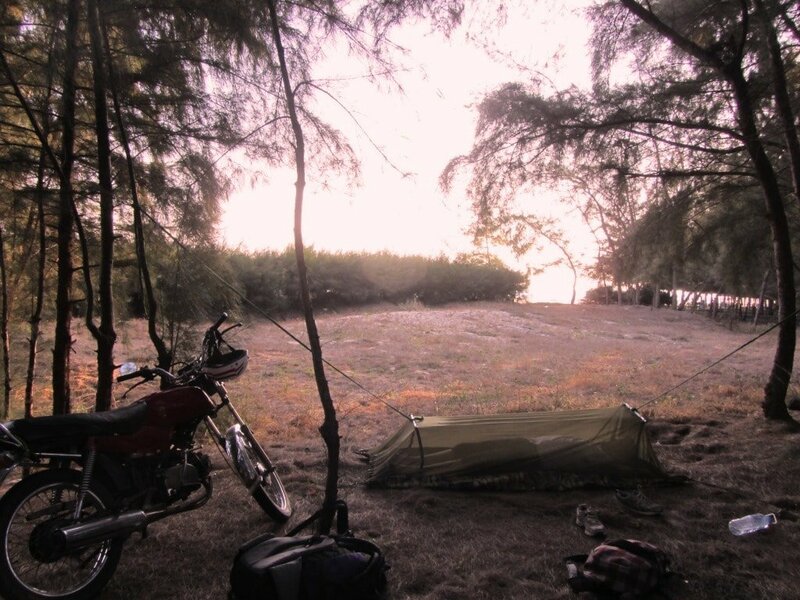 Camping is increasingly popular on both Ho Tram and Ho Coc, and every year more places open beachside campgrounds where you can either pitch your own tent or rent one. Prices are reasonable and facilities are good. High-end and mid-range resorts generally allow non-guests to access their beach for a fee and some beach restaurants also rent deck chairs on the sand. 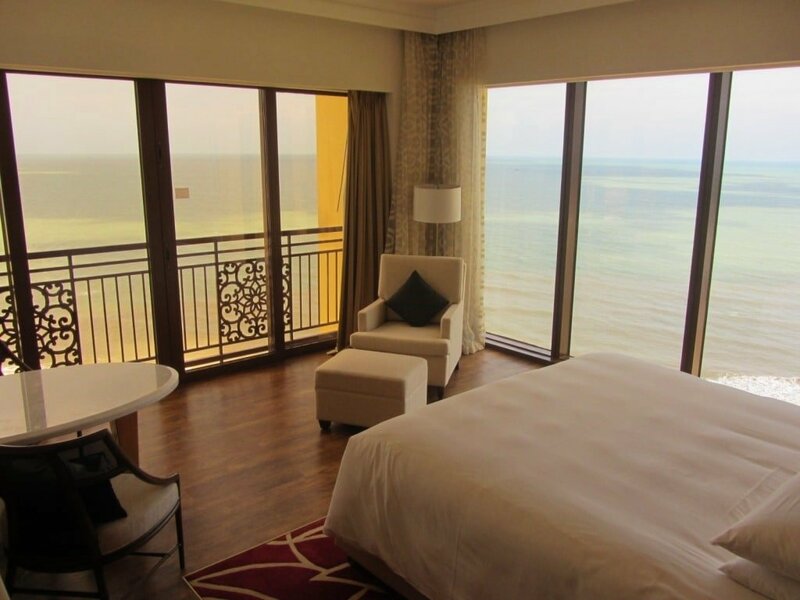 Particularly good places include: Huong Phong Resort, which offers deck chairs and beach access (50,000vnd); Four Seasons Beach (Bãi Bốn Mua), which is in the middle of the sprawling Saigon-Ho Coc complex, where a 70,000vnd ticket gets you beach access, chairs, and showers; Vien Dong, where deck chairs are available for 50,000vnd; and Ho Tram Beach Boutique Resort, where a hefty 550,000vnd gives you access to their gorgeous garden, 2 pools and beach (a good option if you’re planning to stay for the day). There’s still a lot of undeveloped beach along this coast so finding a patch of sand to yourself is not a problem. However, many other people have had the same idea and, sadly, they have not bothered to take their trash with them, leaving an alarming trail of litter which now spoils much of the coastline. If you’re staying on the sandbar at the western end of Ho Tram beach, accommodations there can usually organize boat rides along the Ray River and through the dense mangrove that lines the riverbanks. Much of the non-beach side of the road along Ho Tram is filled with tropical fruit plantations and fish farms; water melons and shrimp make up the majority. Some resorts can arrange mini tours of the farms. Behind Ho Coc beach, the dense jungle is good to explore on foot; ask the reception at your hotel to see what they suggest. The most popular excursion from the beaches is Binh Chau Hot Springs. A very pretty 20 minute ride from Ho Coc beach, these natural springs are a draw for domestic and Russian tourists. The hot water baths, pools, and mud-baths are very soothing and fun, but try to visit on a weekday as it can get busy at other times. It’s a big complex with many different hot-spring-related activities on offer. Prices are from 100-500,000vnd, on top of the 80,000vnd entrance fee. Many of the larger resorts have a range of activities, including paint-balling and fishing. Then, of course, there’s the casino at The Grand Ho Tram and their world-class golf course. Note that non-guests are allowed to play at the casino but you will need to show your passport, and Vietnamese gamers are, by law, not allowed. 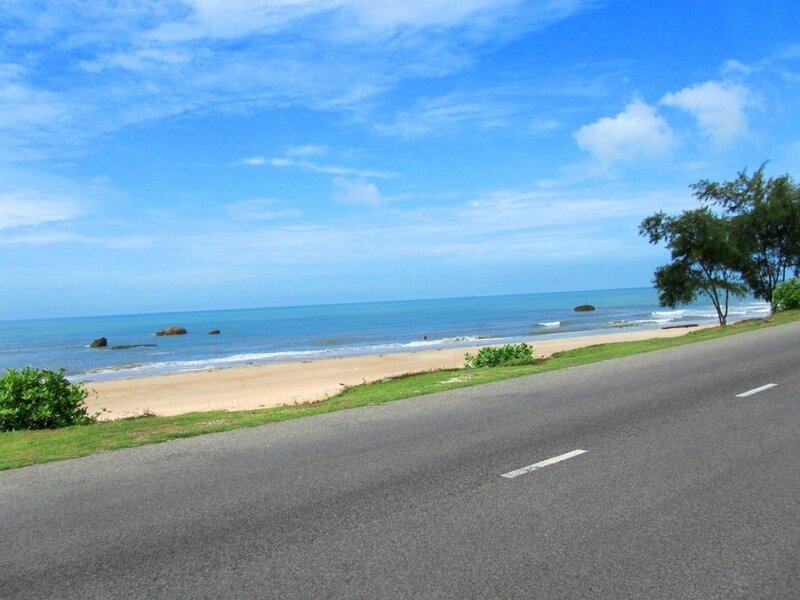 Riding the coast road by bicycle or motorbike is a very rewarding experience. 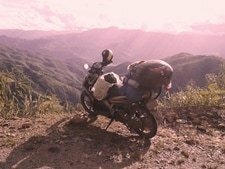 You should be able to negotiate renting a motorbike for the day from most accommodations. 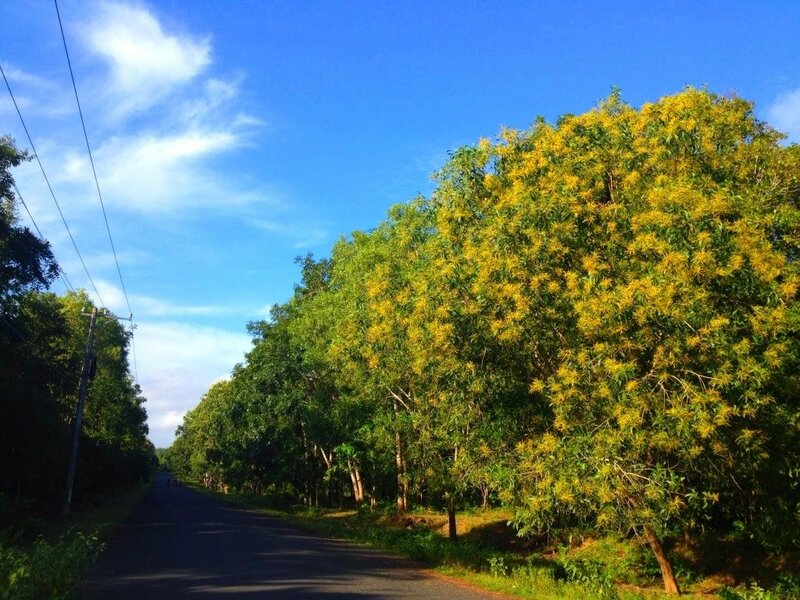 The ride along the Ocean Road from Ho Tram hamlet to Ho Coc beach and on to Binh Chau Hot Springs is particularly scenic, and so is the road north from Ven Ven Hotel, cutting through the dense, animal-echoing jungle. 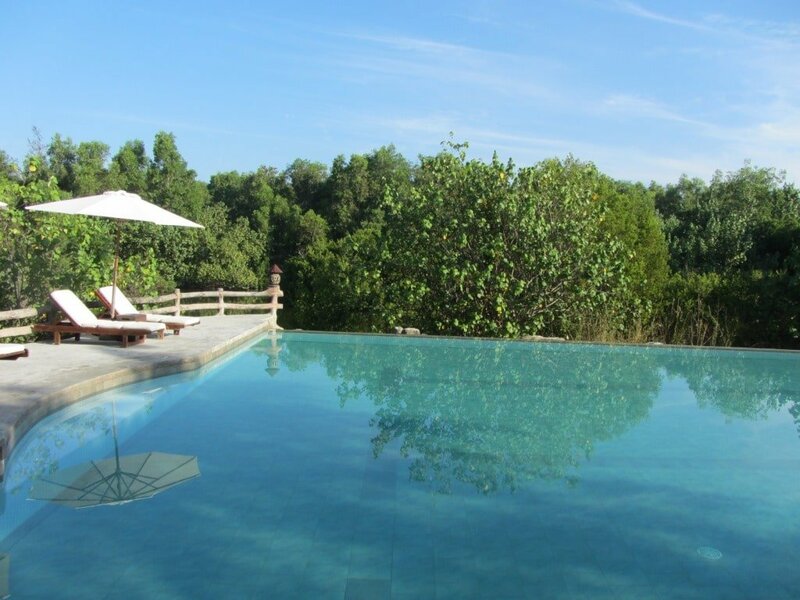 There’s a rapidly growing range of accommodation on Ho Tram and Ho Coc beaches in all price ranges. As the combined length of the beaches is over 20km, the accommodation is spread over a wide area. This means that, unless you have your own wheels, it’s best to know where you’re planning to stay or, even better, have made a reservation, before you arrive. Advanced bookings are essential during public holidays, when prices rise by as much as 40%. The places listed below are in order of my own personal preference in each category. Please Note: I never receive payment for anything I write; all my reviews are 100% independent. You can support my website by booking your accommodation from the BOOK HERE links below. I receive a small commission for any booking (at no extra expense to you), which goes a long way to keeping this site up & running. Thank you. River Ray Estates (camping) [MAP]: With accommodation options in all ranges, River Ray’s cheapest rates are for camping on its extensive, sandy, shady, beachfront. If you have your own tent you can pitch it here and use the facilities, including showers and a pool, for 90,000vnd a night (there are no tents available for rent). It’s located on the sandbar at the western end of Ho Tram beach. The Beach House (camping) [MAP]: Further up the sandbar from River Ray Estates, the Beach House is a decent new option. They have a good campground (including showers) under casuarina trees and a long beachfront. The price is 95,000vnd to pitch your own tent and the same to rent one. Phi Lao (camping) [MAP]: Another camping option, Phi Lao is at the top of the hill just beyond Ho Tram hamlet. They rent tents (100,000vnd) or you can bring your own (50,000vnd) and pitch it on their leafy patio or, if it’s raining, under their roof. Showers included. Saigon Container (camping) [MAP]: A new beach camping option on the future site of the Saigon Container Resort, which portioned off its land years ago but has yet to do anything with it. 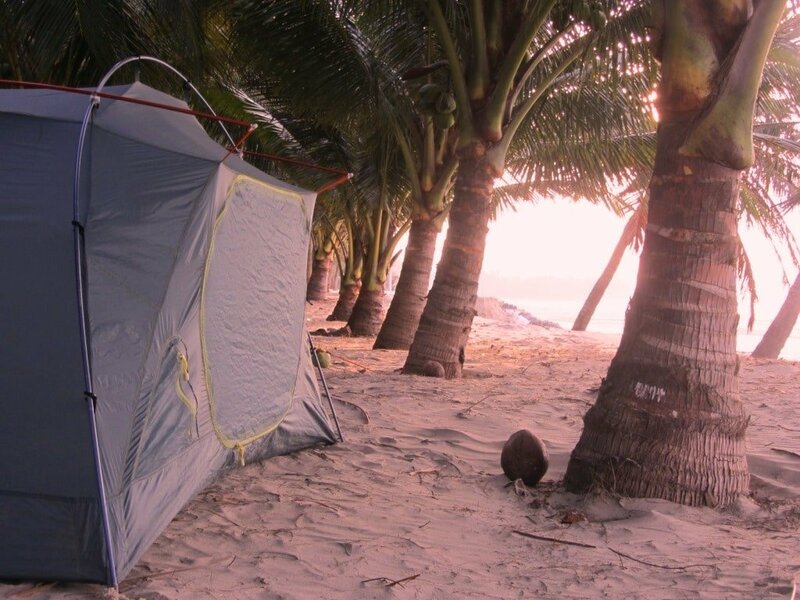 Pitch your tent on the sand or under the trees for a few dollars. Huu Nghi (camping) [MAP]: This local seafood restaurant allows you to pitch your tent (or rent one of theirs) on the beach for a very reasonable 50,000vnd per night. Hoa Lan Hotel [MAP]: A nice little place in the thick of Ho Tram hamlet, Hoa Lan has decent, airy double rooms starting from 300,000vnd a night. Hoa Bien Motel 1 & 2 [MAP]: On either side of Hoa Lan Hotel, this new motel has very clean rooms in a nice leafy courtyard in Ho Tram hamlet. Doubles start from 400,000vnd, but the owners are a little bit cheeky when dealing with foreigners, so you should be able to get prices down by a couple of dollars if it’s not busy. Le Minh Hotel [MAP]: Just beyond T&T, this smart, spotless hotel has good, modern rooms starting from 500,000vnd. Gio Bien 3 Hoa [MAP]: A large and cluttered complex, Gio Bien 3 Hoa is popular with young Vietnamese phượt travellers (independent travellers on motorbikes). It’s definitely aimed at the domestic market (karaoke is often blaring out), but you can pitch your own tent here for 110,000vnd. However, I’d always choose one of the other campgrounds before this one. Hoang Thanh Thuy Hotel [MAP]: With small, dark rooms off an airless corridor, this tiny ‘hotel’ in the middle of Ho Tram hamlet is just about worth it if you’re really trying to save money. Rooms (after bargaining) are 200,000vnd. Saigon-Ho Coc Resort (camping) [MAP]: This vast resort has a very attractive camping area, where you can pitch your own tent (no tents are available to rent) on brick platforms among coconut palms for 150,000vnd. The showers are good and the price includes access to the resort’s long stretch of beach, but use of the pool is extra. 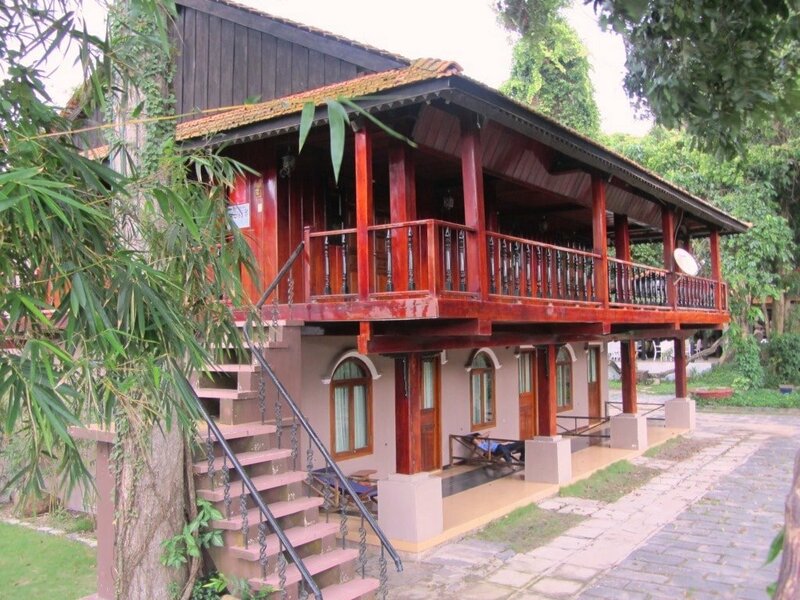 Huong Phong Resort (camping) [MAP]: Similar to Saigon-Ho Coc, Huong Phong is like a cheaper version of the former: a sprawling complex of accommodations, restaurants and cafes. The cheap digs here are tents for rent for 130,000vnd per person. Small and large tents are available or you can pitch your own. 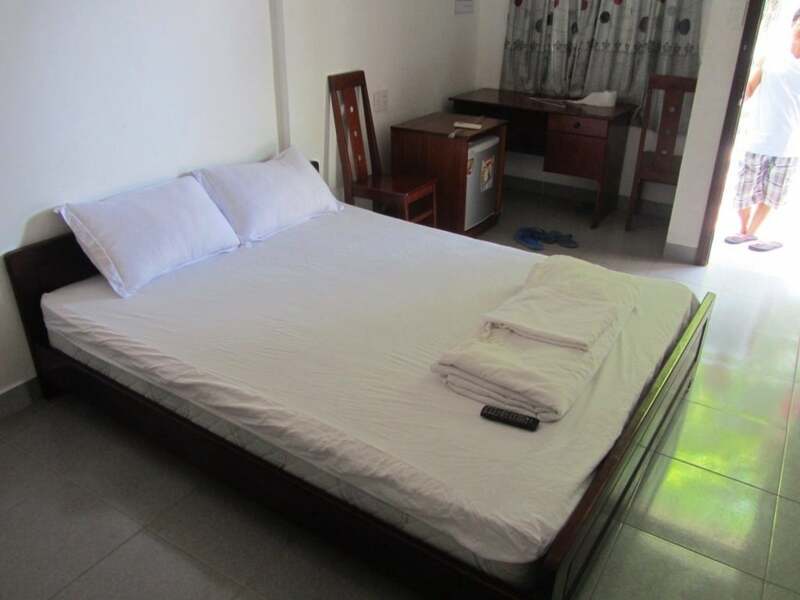 There’s lots of space, good showers, a long beach and a pool (80,000vnd). All the resorts have restaurants and there are a fair amount of informal eateries lining the beach road too. 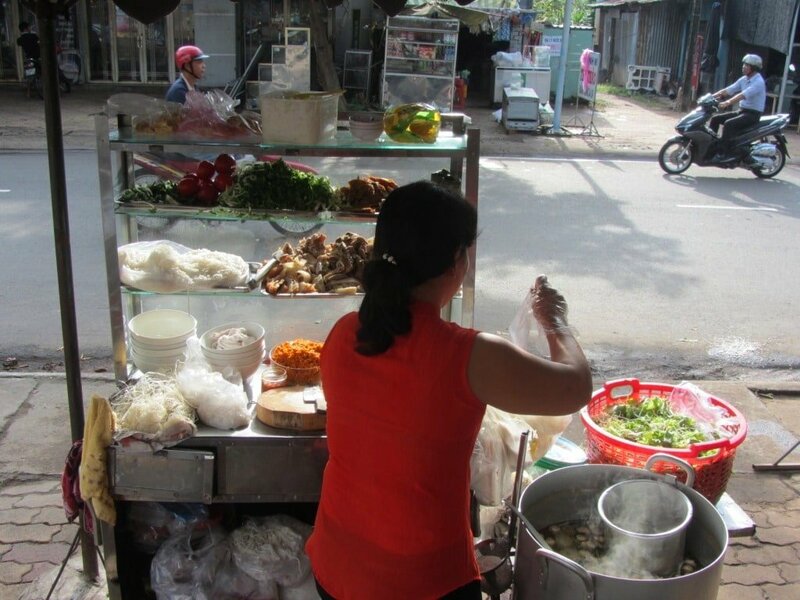 Unsurprisingly, seafood is on all the menus on Ho Tram and Ho Coc beaches. Below I’ve listed some of the best places to eat, in order of my own personal preference, regardless of price. Ho Tram Hamlet Seafood Restaurants [MAP]: The best, freshest, cheapest seafood is found in the simple seafood restaurants in Ho Tram hamlet, just before the municipal beach. There’s a cluster of them here, but after years of eating around, my favourites are Mỹ Lệ, Kỳ and Hoa Phượng. Choose your live seafood from containers displayed on the ground – oysters (hàu), clams (nghêu), scallops (sò điệp), fish (cá), shrimp (tôm), lobster (tôm hùng), octopus (bạch tuộc), snails (ốc), crab (ghẹ) and things you’ve never seen before. There’s no menu and no price-list, so unless you speak some Vietnamese it’s all about pointing and sign-language. Indicate what you want and how much of it you want. Then how you want it cooked: steamed (hấp) or grilled (nướng). 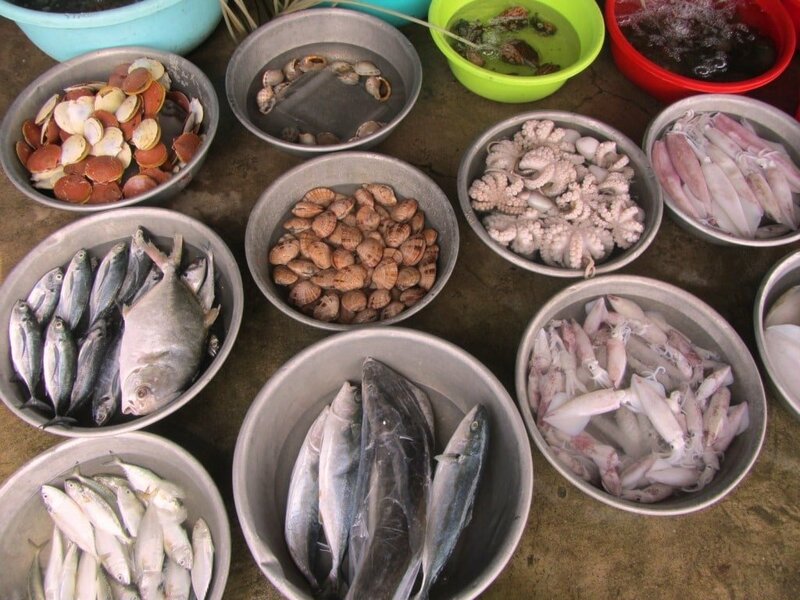 Prices are very reasonable: in general, shellfish is 100,000vnd per kilo (half a kilo is enough for 2 people), and bigger seafood is between 150-350,000vnd per kilo. There’s a small cooking charge on top of the raw seafood: 10,000vnd for steamed; 20,000vnd for grilled. The food is fresh, simply cooked then dipped in salt, pepper, chilli and lime, and served up on plastic plates at plastic tables on a bare concrete floor strewn with shells. It’s delicious and unpretentious; a fabulous dining experience, and very Vietnamese. Oh and there’s cheap, cold, local beer as well. Ven Ven Hotel Restaurant [MAP]: The best of the hotel restaurants, Ven Ven has steadily gained a reputation for good, home-cooked Vietnamese dishes over the years. The restaurant is beautifully situated on a patio under trees and tiled roofs with wind chimes singing in the breeze. Dishes are fresh, crisp and clean. Prices are steadily rising but are still reasonable: 50-150,000vnd per dish. Try the steamed mustard leaf with ginger, sauteed shrimp with lemongrass, and stewed fish in a clay pot – all homely classics. Huu Nghi Restaurant [MAP]: If you’re camping here then it makes sense to eat here too, but even if you’re not, this open-sided, beachfront seafood restaurant is a good place for lunch. Dine of crab, fish, shellfish, rice and vegetables, sitting in little thatched gazebos on the sand. 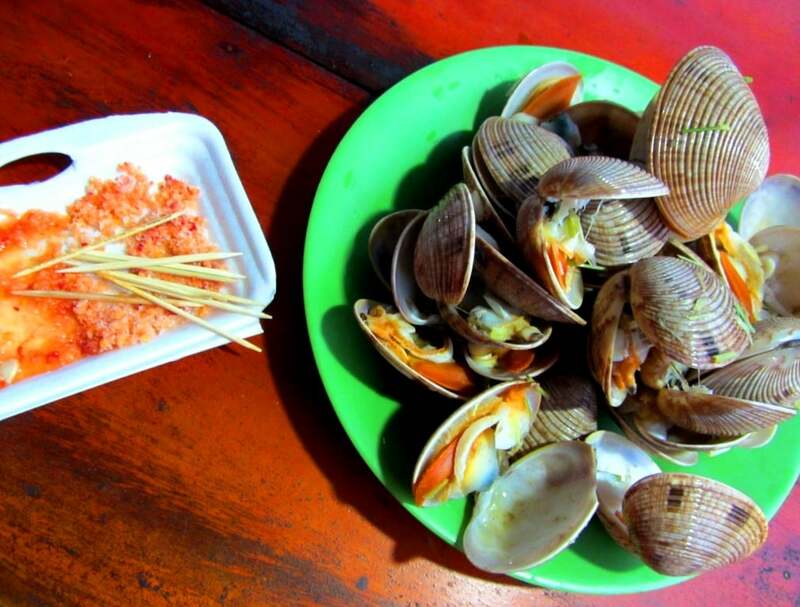 Seafood dishes start from 50,000vnd. The Grand Ho Tram [MAP]: With a dozen different cafes, bars and restaurants, The Grand covers everything from Chinese to Japanese, Vietnamese to European. Prices are high but represent good value, because the quality of the food and drink – from cakes in The Grand Cafe to Steaks in The Grand Bistro – is superb. Expect to pay between $20-$40 per person. Phuoc Buu Street Food [MAP]: The little town of Phuoc Buu (also known as Ba To) is 10km north of Ho Tram hamlet. It’s easy to get here if you have your own wheels or you can get a taxi from your accommodation on the beach. There’s one street here which is lined with excellent street food stalls. Head to Huynh Minh Thanh Street from 5pm-8pm and food-hop from one stall to the next, dining on grilled chicken, roast pork, noodle soups and more. 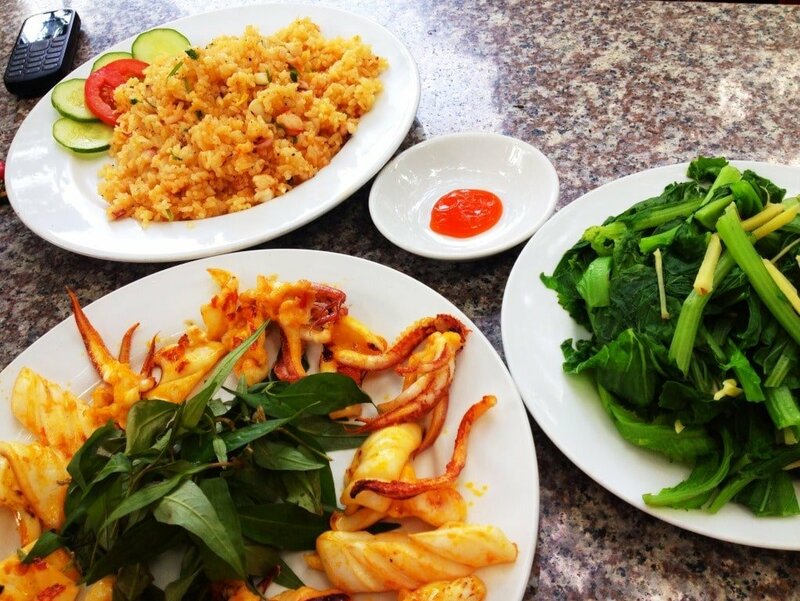 It’s a very local experience and each dish will only cost you 20-40,000vnd. Ho Tram Beach Boutique Resort Restaurant [MAP]: Open to non-guests, there’s a wide range of dishes available here, including some excellent Vietnamese classics. The setting is very romantic at night, with candles, lanterns and a sea breeze. Mains start from 150,000vnd. Saigon-Ho Coc Resort [MAP]: The main restaurant here has a great range of Vietnamese dishes, including lots of seafood. Quality is good and prices are around 60-150,000vnd per dish. Binh Chau Market [MAP]: If you’ve got your own wheels and you’re heading to Binh Chau Hot Springs, the local market in town has a few excellent noodle soup stalls. 20-30,000vnd will get you beautifully presented bowls of green papaya salad (gỏi đu đủ) or cold noodle salad with marinated pork (bún thịt nướng). Ho Tram BBQ Restaurant [MAP]: You’ll see advertising billboards for this place all around the area. A large restaurant, back a couple of kilometres from the beach, Ho Tram BBQ has a whole host of grilled seafood and meat. Good if you’re in a group. Others: Almost all of the accommodation options mentioned above have somewhere for their guests to dine (even the campgrounds). 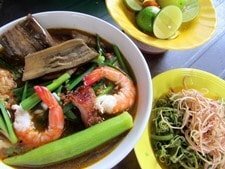 Apart from the fantastic seafood restaurants in Ho Tram hamlet, there are also dozens of other places scattered around the crossroads there, selling all kinds of food at reasonable prices: from noodle soups to rice and meat. Getting to and from Ho Tram and Ho Coc beaches from Saigon is much easier and quicker than ever before. However, there is still no regular direct public transportation to the beaches. If you have your own wheels, it’s a simple, easy, quick journey. If you are staying in one of the high-end resorts and have booked in advance, then you may receive a free shuttle service from Saigon to your accommodation, or at the very least the resort will be able to arrange or advise on transportation for you. If you are using public transport you will need to change vehicles at least once and there are several possible combinations, including mini-van, bus, taxi, motorbike taxi, and boat. By Motorbike: Follow this map. Take the Cat Lai ferry across the Dong Nai River, follow Road DT769 through Nhon Trach industrial estate until it meets Highway QL51 (also marked AH17). Turn south onto the highway towards Ba Ria. Exit Ba Ria on Highway QL55. Bear right (due southeast) on Road TL44B. When this road meets TL44A, go straight across onto Vo Van Kiet street which then becomes Ven Bien street: this is the Ocean Road that takes you to Ho Tram and Ho Coc. The total distance is 110/120km. If you know the route well and you are a confident rider, journey time is around 2 hours. However, including stops for gas or drinks and map checking, 3 hours is more likely. By Bus & Taxi: Take one of the many mini-buses leaving Saigon’s Mien Dong bus station every 15 minutes to Vung Tau (80,000vnd, 2 hours). You can either stay on until Vung Tau or get off at Ba Ria (30km north of Vung Tau). From either of these stops you can take a taxi to Ho Tram or Ho Coc beaches (around 45 minutes; approximately 650,000vnd). Alternatively, you can find a xe ôm (motorbike taxi) which should be half the price, but you’ll have to bargain hard. Although the taxi may sound expensive, once the fare is divided between you (assuming you are not travelling alone), it’s really not that much. 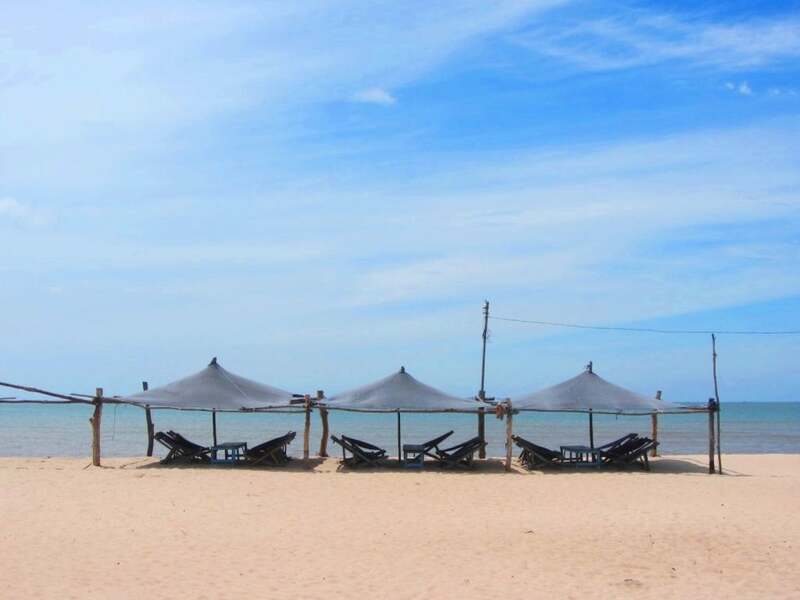 There are some local buses from Ba Ria and Vung Tau which trundle down to the beaches, but you’ll need time and patience to make these connections. By Boat & Taxi: Another alternative is to take the ferry from Saigon to Vung Tau (1 hour 15 minutes) and then a taxi. 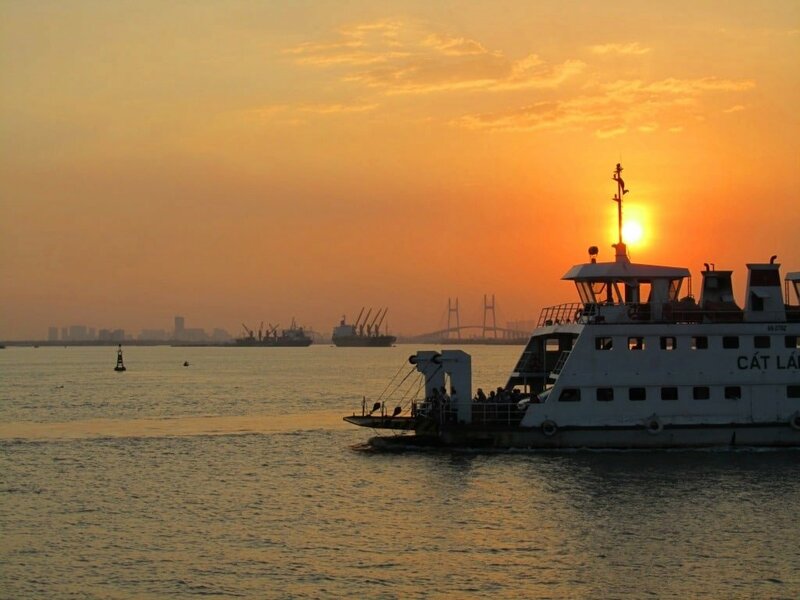 The ferry is very scenic and a lot of fun, but ticket prices are high (250,000vnd) and services are far less frequent than they used to be now that the Vung Tau highway has been upgraded. See the Greenlines website for details. Local buses ply the Ocean Road but you’ll need to ask your accommodation for schedules and times. Renting motorbikes for the day is a great way to explore the area. Most hotels should be able to arrange rental for 100-200,000vnd per day. There are also some local taxi companies which can be arranged through your hotel. 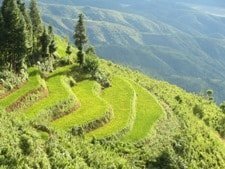 Islands: Con Dao or Phu Quoc? 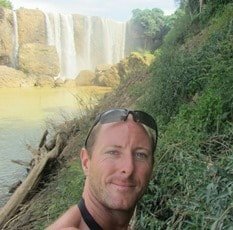 This entry was posted in ALL, Beaches, DESTINATIONS, Near Saigon, The South and tagged beaches, blog, guide, Ho Coc, Ho Tram, near Ho Chi Minh City, Saigon day trips, travel, Vietnam. Bookmark the permalink. Thanks so much for all your articles. We’ve been using a lot of them throughout our motorbike travel from north to south. Just wanted to inform that Huong Phuong Resort upped its beach entrance to 80.000 dong per guest. 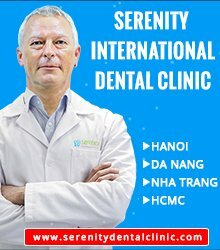 Again, you’ve been a great help to experiencing Vietnam. Definitely coming back for more! Thanks for this reminder of a lovely piece of the coast that we visited on our first trip to Vietnam ten years ago. More recently a mate and I stopped at Ho Coc and had some grilled baby skate from their bbq that was just so good. Look out for that next time. Thanks for the tip – sounds delicious. 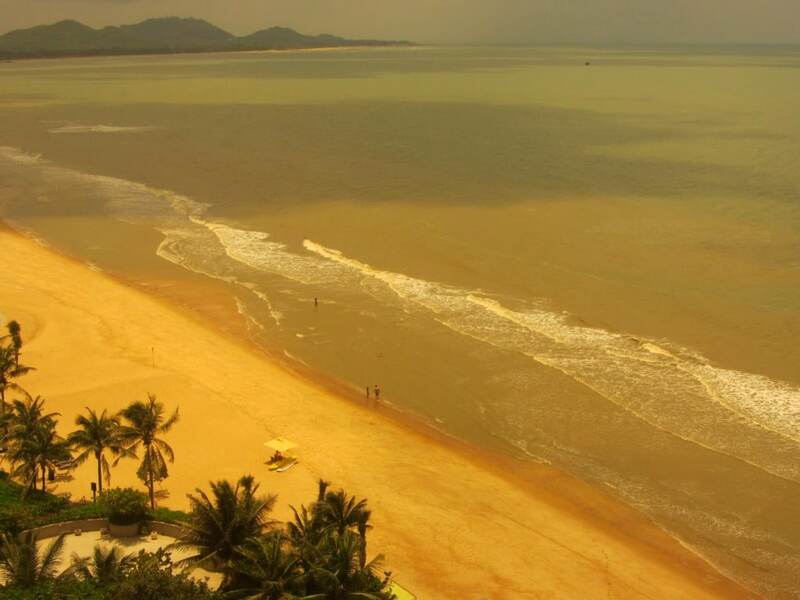 Just an update… Phong Huong in Ho Coc charges 120k VND per person now to access their strip of beach. Was just there today. Its pretty but a lot pricier than expected. Thank you for the update. It could be that they put their prices up for the high season (Christmas, New Year, Tet). I’ll check it out next time I’m there out of high season. The Cat Lai ferry runs all day (every 10 minutes or so) during the day time, and all night (every 30 minutes or so) during the night time. Super helpful thank you! Do you have any recommendations for the best place to camp, we will have to hire a tent. The Beach House looks like a good spot. Do you normally have to reserve on a weekend for camp spots and tents or shall we just turn up? It could get reasonably busy on the weekend, but if you turn up sometime before midday then I think it’d still be OK. Yes, the Beach House is good, although I’m in the area right now and the sea is a bit choppy. Ok, thanks for the tip. I guess it’s often choppy there. Is there another part to camp that may be nicer? I would just get to the area – try to get their early-ish – and take a look around at a few of the campgrounds before making a decision. Thank you so much!! I’m excited to check it out. Great blog and thank you for the recommendation! No guidebook I’d come across mentioned Ho Tram, and friends who’d visited Vietnam/travellers I met had never heard of it. The Ho Tram Beach Boutique Resort was also a great tip – I had a perfect stay – thanks again!